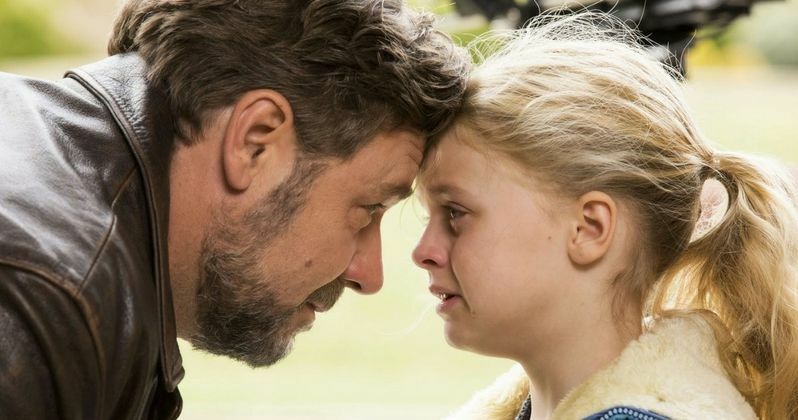 Russell Crowe reunites with his Les Miserables co-star Amanda Seyfried in the first trailer from Voltage Pictures' Fathers and Daughters. The studio still has not issued a release date for this upcoming drama, directed by Gabriele Muccino (The Pursuit of Happyness), but it is expected to be released by the end of this year for Academy Awards season consideration. While we wait for that announcement, you can check out the first footage from this upcoming drama. Jake Davis (Russell Crowe), a Pulitzer-winning novelist, finds himself fighting against the world when a fatal car accident leaves him to raise his 5-year-old daughter, Katie, all on his own. Overcome with guilt from the loss of his wife, he struggles with the daily routine of raising a child compounded by his overbearing relatives intent on taking her away from him. As the narrative weaves back and forth between the 1980s, and present day, we come to learn how 30-year-old Katie (Amanda Seyfried) battles the demons that stemmed from her troubled childhood and simultaneously watch how Jake fights to hold on to the thing he loves most - his daughter, at the cost of his fortune, sanity, and ultimately even his own life. This beautiful performance-driven-piece reads thematically as such American classics: American Beauty and The Pursuit of Happyness - both unforgotten and inspiring. The supporting cast includes Aaron Paul, Diane Kruger, Janet McTeer, Jane Fonda, Bruce Greenwood, Ryan Eggold, Octavia Spencer and Quvenzhané Wallis. The original movie script was written by newcomer Brad Desch in his screenwriting debut, which made the Black List in 2012. Russell Crowe also serves as an executive producer on this upcoming drama, with Voltage Pictures' Nicolas Chartier, Sherryl Clark and Craig J. Flores producing. We won't know about the drama's Oscar awards prospects until the film hits theaters later this year. But going off this new footage, Fathers and Daughters could surely be in the mix for awards season contention. Check out the first trailer for Fathers and Daughters below, and let us know what you think of the first footage. Could this project land Russell Crowe his first Oscar nomination, or give Amanda Seyfried her very first Oscar nod? Be sure to check back for details on when Fathers and Daughters will hit theaters nationwide.